Located in New York City, SHAKTIBARRE is a fusion yoga-barre studio and community space that provides unique exercise and movement classes, along with educational and sustainable wellness experiences, to people of all athletic abilities. In August 2016, SHAKTIBARRE opened its doors and today, has 20 instructors and over 15,600 students. The classes incorporate isometric ballet movements, cognitive toning, positive and inclusive messaging, yoga breathing, ever-changing routines, a team-building environment and meditation to build both strength and calm. Corinne Wainer, co-founder, has been a huge part of SHAKTIBARRE’s success. We connect with this fitness instructor and entrepreneur to learn more about her journey and the theory behind these motivating yoga-barre workouts. What inspired you to create SHAKTIBARRE? It came from the idea that the boutique fitness industry is both measurably profitable and exclusive. We wanted to make a decent pay cheque, while also empowering others to afford and engage in the movement experiences they love. From where does the name SHAKTIBARRE stem? Shakti means, “Goddess of activism or change.” The idea is that through our unique barre sequencing, participants are inspired to become the advocate of their own lives, as well as being helpful and compassionate to others. What peaked your interest first – yoga or barre? For me, it was barre because it paralleled the athleticism I was so used to in my younger years, as well as the concentric motions from Kundalini (also known as chi or bio-energy) that changed my life as an adult. As co-founder, why were you empowered to mix and mashup yoga and barre into one unique workout experience? I believe fitness without mindfulness is just an injustice. With such a large percentage of our market being women, why would we only get them in a studio to get toned? It’s an opportunity to do so much more, especially if the offerings are accessible and the conversation is high-level. On the SHAKTIBARRE website, there is a lot of content that highlights how your classes help all guests connect with their inside-self. What is significant about this mandate for people who practice and exercise with you? We mean creator-nurturer in us all, which we seem to stray from when stressed or overworked. From a place of fear, humans are unable to elevate together. On that note, describe the people that attend SHAKTIBARRE classes? To whom does it appeal? It appeals to all sorts of people, particularly those who are open-minded, like to feel honoured and treated kindly — like a queen! — and largely, people who are go-getters. Where is SHAKTIBARRE located? Would you ever consider coming north of the border and enticing a Canadian audience (aka ME)? We’re in Brooklyn, NYC and we recently expanded to Harlem! We’re excited to build more studios in 2019 and are open to more locations, as long as we keep scaling consciously and with deep respect for and understanding of our students. How much does a SHAKTIBARRE membership cost? Memberships are based on income and can vary from packages to monthly purchases. As a barometre, an auto-renew yearly membership costs between $108 and $180 [USD] a month. I learned about SHAKTIBARRE via POPSUGAR Fitness. I tried your Yoga-Barre Hybrid Workout to Empower Your Body and Mind. At first, I found the pace of this class to be a bit slower than what I was used to, but by the end, I was dripping in sweat and feeling very calm and ready to conquer the challenges ahead. What type of feedback have you received regarding this collaboration with POPSUGAR? I’ve received the same feedback — that the pace [of the video is] much slower than our live classes, which is true. Many of the comments on this video are published by people who tried the workout while menstruating. They highlight how the hybrid, short class helped them reduce anxiety and stress. How does feedback like this make you feel? How do you use this feedback to continue to grow the SHAKTIBARRE mission and vision? Even before that feedback, as an educational psychologist, the entire SHAKTIBARRE sequence is designed to reduce anxiety. I hope to turn it into a quantifiable study someday soon. The language in which SHAKTIBARRE shares content is very inclusive. Even during the POPSUGAR video, you mention unique fitness ability and offer a modified version of the workout for broad audiences. Why is it important for SHAKTIBARRE and other fitness companies to take this approach? Every fitness company, especially if they label themselves as “mindful,” should be increasingly aware of the fact that putting your views onto people who have their own existing perspectives of “fitness” is just another form of oppression. Being open and accepting are socially and spiritually the right things to do, bringing us closer to real inclusion. How does incorporating inclusion and diversity in an exercise setting empower people who take your classes? Diversity spans many areas and people on any given day. Some demographics certainly experience this ten-fold and they know what it’s like to feel unmet. We work to empower our students to be aware of their own resilience as a reclamation back to their bodies, minds, communities and salient world issues. What has been the largest challenge with SHAKTIBARRE? What have you learned from it? The largest challenge has been scaling slowly, while the mission and demand are so high. There are pros and cons to scaling more quickly, namely being the risk of losing the intimacy of our classes. 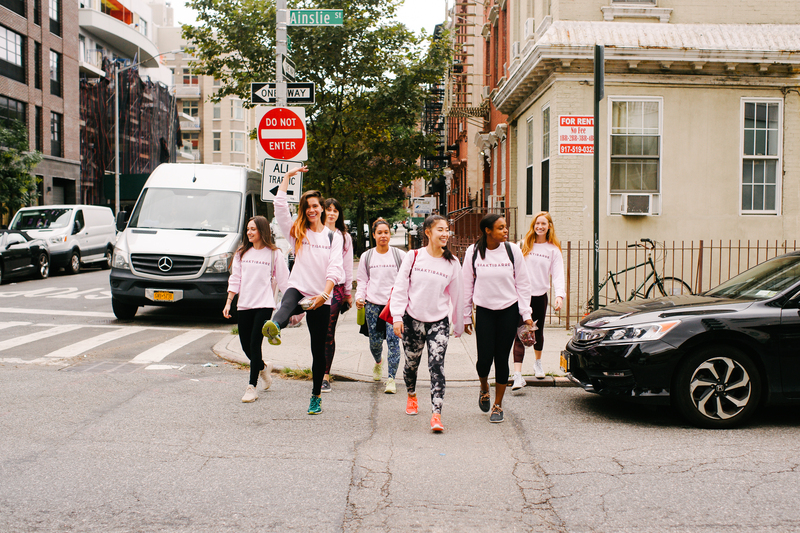 What’s a day in the life of a SHAKTIBARRE co-founder? I wake up at 6:20 a.m., have water and tea or coffee, while wearing a face mask and doing Kundalini in my bedroom. From there, it’s straight to exercise and a shower. Typically, I walk a lot, taking private mentorship calls or attending business meetings and then I teach, teach, teach. I also get positively sidetracked by having real talks with students and going ham on the marketing and design aspects of SHAKTIBARRE — the artistry of it all keeps me enchanted, just as much as the impact. From all of your experiences so far, what advice would you offer other aspiring fitness professionals and business owners? You must monetize a need that people crave in some form or another — not a need or idea that only YOU want. What does 2019 have in store for SHAKTIBARRE? Corinne, thank you for sharing your story with A Quarter Young. We hope you’ll share more content with POPSUGAR soon and maybe even come to Canada! To learn more about SHAKTIBARRE, follow them on Instagram and like them on Facebook. The feature photo is by Diego Bazan.